The New Yorker just published “What Is a Woman? – The dispute between radical feminism and transgenderism” by Michelle Goldberg. Her piece provides a good summary of the differences in political analysis between radical feminsts and liberal transgenderists, from their different views on gender and whether “girl brains” exist to the real-world effects on women. Having interviewed Lierre Keith and Rachel of DGR, other radical feminists veteran and new, and prominent transactivists, Goldberg provides a useful introduction to this decades-old debate. The article makes clear the need for women to have women-only safe spaces for meeting, organizing, and letting down their guard. Goldberg describes the pattern of threats against and silencing of women who question queer theory, from deplatforming to cancelation of venues to straight-up death threats. (The article does not attempt to cover transactivists’ pattern of physically assaulting women who disagree with them.) 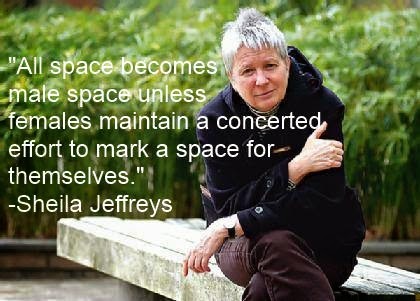 The article quotes Sandy Stone, a man who identifies as a woman: “I am going to have to say [to women who want women-only spaces], It’s your place to stay out of spaces where transgender male-to-female people go. It’s not our job to avoid you.” Sandy’s statement perfectly illustrates the male entitlement behavior radical feminists are working so hard to dismantle. Summary of and videos from Radfems Respond, an event mentioned in the article.